Perched high upon the broad limbs of a narrative, yet shrouded by the brambles of private musings, literary eyes track the flight of Katharina von Bora. From the swell of this drama, an escape through moonlit woods from a convent in Nimbschen, evolves a poignant and remarkably tender profile of a woman’s inner strength. This passion, captured by Scheib’s pen, has managed to transcend Katharina von Bora beyond any historical footnote labeling her simply as wife to the father of Protestant Reformation. Left to a convent as a child by her impoverished father, Katharina became a nun despite her driving undercurrents that defied her Catholic teaching. Despite physical and sexual abuses, she was spared her sanity by way of a bosom confidante and her irrepressible vein of independence that led to marginal acts of rebellion. Embracing the theology of young Martin Luther, and inspired by the Reformation, she fled with eight young nuns to Wittenberg. Sidestepping the erosive action of excessive detail and banal period characterizations, Scheib effectively illuminates the complexities of Katharina von Bora and of relationships in general. 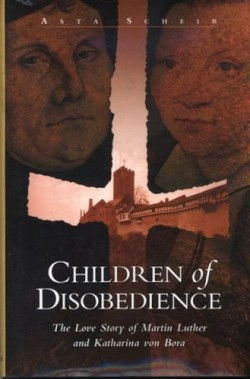 Disobedience engages readers in this manner, treating its religious backdrop with historical objectivity and remaining accessible to a diverse audience. With the alphabet re-beaded to dress a foreign tongue, translator Ward and author Scheib present this English version of Kinder des Ungehorsams, which was originally met with wide acclaim when first published in Germany in 1996. Reflecting the author’s ample research, including documented letters from Martin Luther to Katharina, the novel is faithful to history, and merges a seamless blend of events and emotion.